A big thank you to Elmer’s for sponsoring today’s post! My absolute favorite thing about back to school time is the amazing deals on school supplies. I always feel like a giddy school child as I walk down the aisles mesmerized by all of the bright colors and fun supplies. One item I always make sure to stock up on is Elmer’s glue. It’s a staple not only in our home but at my children’s school too. In fact, every year one of the items at the top of my children’s teacher donation wish list is glue sticks. 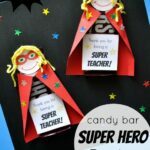 With the fantastic sales going on right now, it’s the perfect time to stock up on some extra supplies and put together a back to school teacher gift for your child’s teacher. 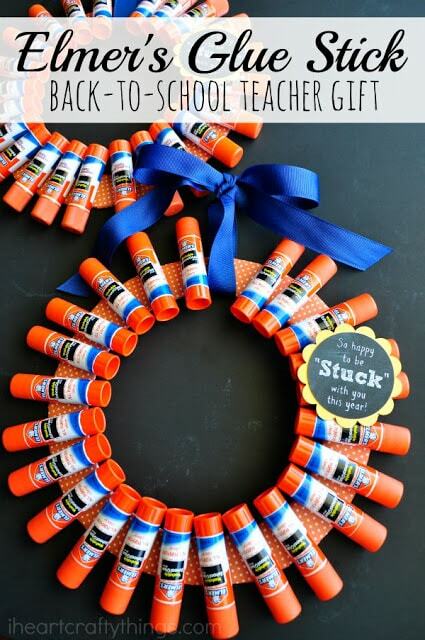 I’m sharing today how we turned some school supplies into a fun Elmer’s Glue Stick Wreath. 1. Start by cutting the center of your 10-inch cardboard circle out, leaving about an 1-1/2″ rim around it. Also cut a circle out of your scrapbook paper that is an inch bigger on both the inside and outside of your cardboard circle. I found it easiest to trace my circle on my scrapbook paper and then cut around it. 2. Cut slits around the outside and inside of the circle on your scrapbook paper, stopping the cut where your traced circle is. 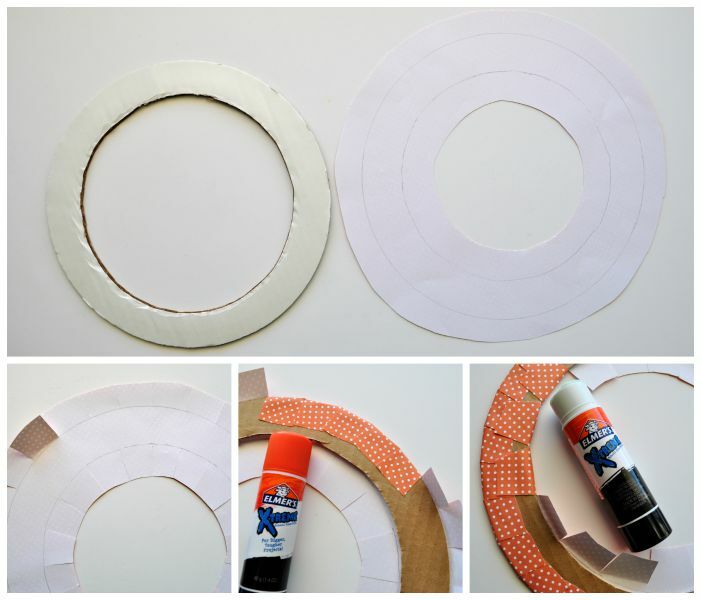 Lay your cardboard circle onto the back of your scrapbook paper. Bend each section onto your cardboard circle and use your Elmer’s X-TREME School Glue Stick to glue them to the back of your cardboard circle. 3. After finishing the outside, continue bending down and gluing the sections on the inside of the cardboard circle. 4. 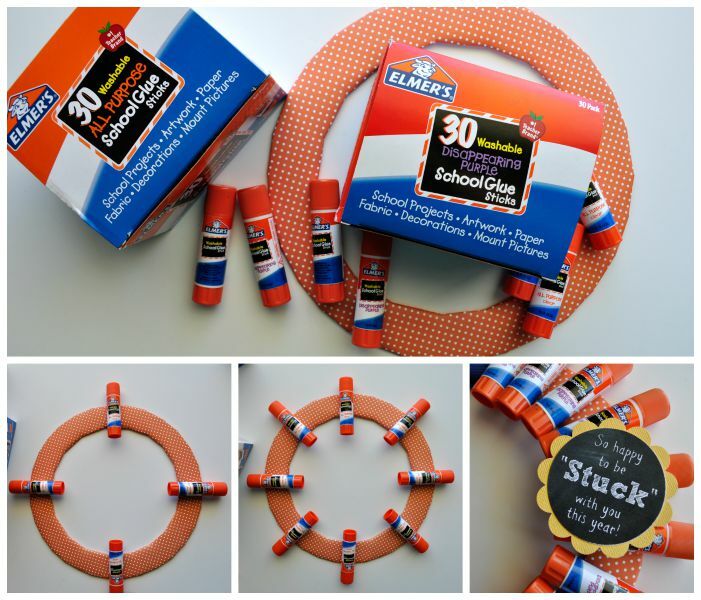 Once your cardboard circle is covered with your scrapbook paper, get out your Elmer’s School Glue Sticks and Glue Spots. 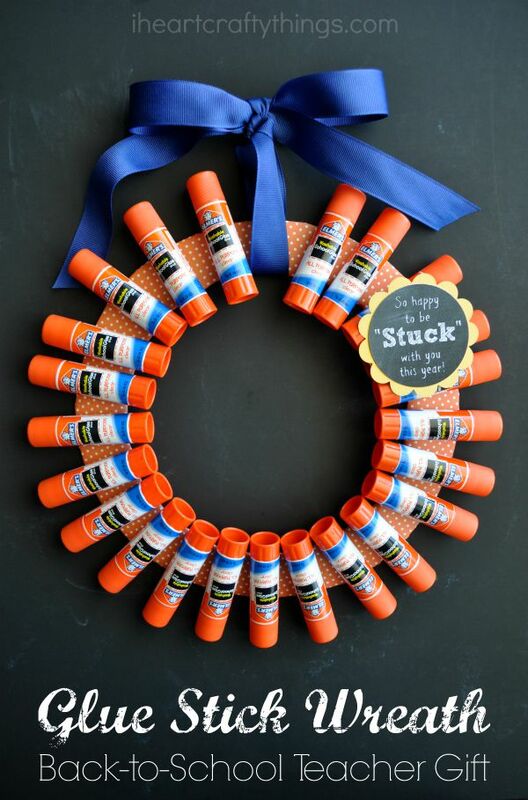 Put a Glue Spot onto the back of the Glue Sticks and attach them to the cardboard circle. I first glued one on top and bottom and both sides. 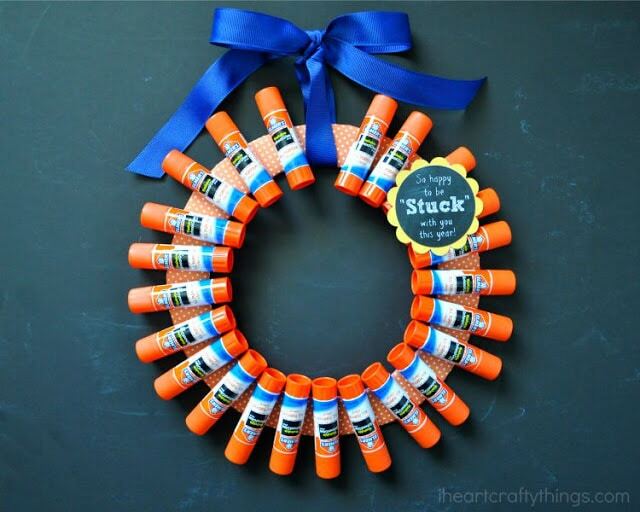 Then one in the middle of each of the sections, and continued around the circle filling it with the Glue Sticks leaving an open space for a ribbon. 5. 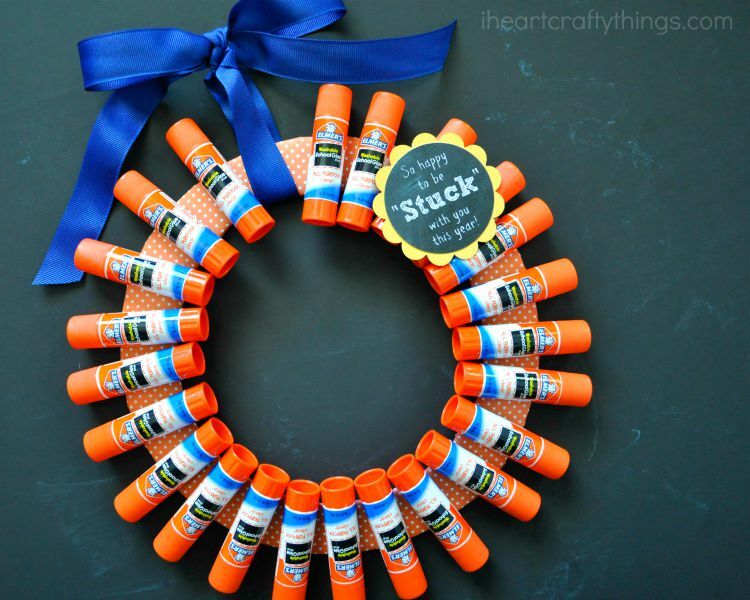 Tie a ribbon around the top so it can hang as a wreath. 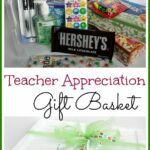 If you would like, print off the gift tag printable and cut it out. We layered it with a yellow scallop shape on the back of it. Attach it to the wreath with a Glue Spot or tape to finish your teacher gift. 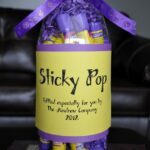 The little gift tag says ‘So happy to be “Stuck” with you this year!’ It turned out to be such a fun gift. 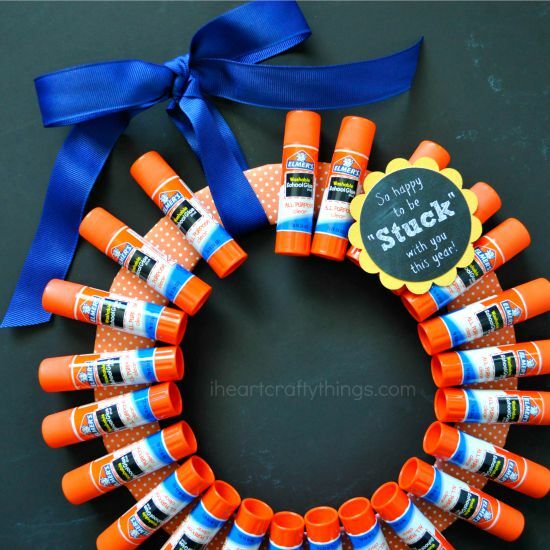 I know my children’s teachers will appreciate how they can display the wreath temporarily and then use the Glue Sticks within the classroom when they are needed. Does your family have any back-to-school traditions? This post was sponsored and written by me on behalf of Elmer’s Products, Inc. All opinions expressed are my own.